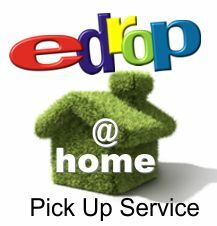 Edrop @ Home Pick Up Service – E-Drop – You drop it off, we sell it online! Your edrop @ home appointment is the most convenient way to utilize our service! Just set an appointment with our edrop team and we will come to YOU! We’ll give you an on-site estimate of what your items are selling for online then either photograph your items or take them back to our location where we’ll list them on our sites. We only ask that you make an effort to have the items you’d like us to sell organized and in an easily accessible area. If you do NOT wish us to take the items with us, please have them weighed and ready to photograph. We will also need model or serial numbers from these items as well. A small $50 fee is charged for our service, and your edrop specialist will be scheduled for up to two hours (additional hours may be arranged on-site based on availability at $10.00/hr). Should you need to cancel or reschedule please contact us at least TWO hours prior to your appointment.